Allows for simple retrofit installation to existing ducts. The furnace is controlled by existing thermostats. Using the proven principle of forcing air through ducts, the Conforto KLE is a 100% efficient system that requires no chimney. The fan combined with a direct connection to existing ducts substantially reduces turbulence, vibration and noise. With its ingenious design, the Conforto KLE allows air conditioning units with electronic and humidifying filters to be added. Fan chamber is isolated for more comfort. The heat coil controls provide three power settings. 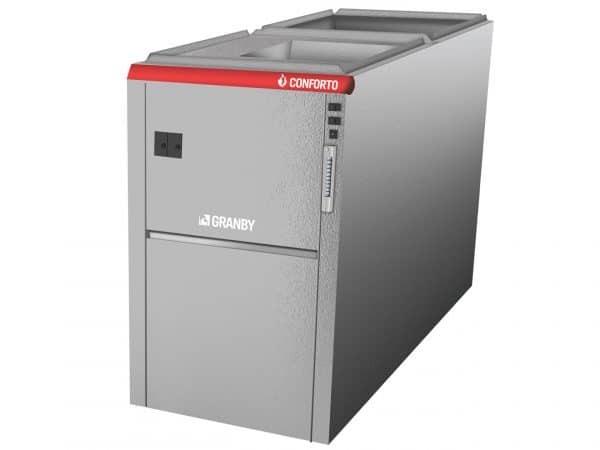 Combined with a fan that can be set at low or automatic speed, the Conforto KLE allows you to adjust the comfort level according to your needs. No chimney; 100% of the heat stays inside.